Fig 1a Polar stripes of PbTiO3 on a SrTiO3 substrates (under slight compresive strain). Fig. 1b Polar stripes of a PbTiO3 film on a DyScO3 substrate (under slight tensile strain). In our case of a 5nm thick film, the periodicity is found to be 27nm (about 67 unit cells). Fig. 2 Reciprocal space map around the 001 reflection. The DyScO3 substrate appears as a sharp intense peak at L= 1 (axes are r.l.u. of the substrate). The PbTiO3 film displays a much broader Bragg reflection (as expected from a 5nm film) around L= 0.96, coherent with the substrate. Two satellites are also observed at both sides of the film peak. The distance from those to the Bragg rod is the same for all investigated reflections. This is the signature of a second periodicity of around 30nm. Temperature dependence and time stability shows that the origin of the modulation is polar and not structural. Fig. 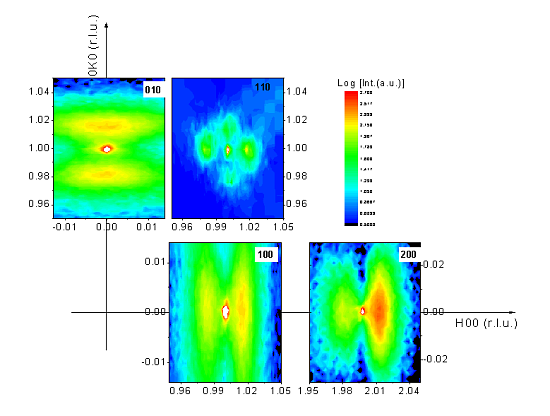 3 In-plane area maps around (010), (100), (200) and (110) reflections showing the very sharp Bragg peak and the broader intensity maxima characteristic of a second periodicity (~27nm) in the films. Note: Unlike the other three, the (110) map was taken with an analizer crystal. Its linear intensity scale does not correspond to the one showed and it has not been included for clarity. Ferro-piezoelectrics are the active elements in a very large number of applications from gas lighters to alarm buzzers. Their properties arise from the presence of a spontaneous polarization. 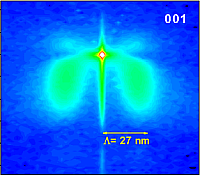 Thin films of the classical ferroelectric PbTiO3 subjected to a small tensile strain have been successfully grown unit-cell-by-unit-cell and investigated by using x-ray diffraction. This work demonstrates that i) controlling the growth of thin films at the atomic level allows creating novel phases not existing in bulk, and thus fine-tuning the functional performance through symmetry engineering at the unit-cell level, and ii) x-ray analysis of diffuse scattering around diffraction peaks is a powerful tool to establish the polar symmetry of ultra-thin ferroelectric films, a notoriously difficult problem in this field. Ferroelectrics are insulators with spontaneous switchable polarization. They thus behave under electric field very much as ferromagnets under a magnetic field with the difference that in ferroelectrics it is the actual shift of the atoms in the structure what causes the electrical dipole. Ferroelectrics also have the largest dielectric susceptibilities of all materials and attract a great deal of attention for their use as non-volatile memories, high-dielectrics and sensors, conveniently driven by voltage. Moreover ferroelectrics can deform under an electric field and, conversely, can produce a very large voltage difference across them when pushed or stretched. In other words, they are so-called piezoelectrics. This duality places ferro-piezoelectrics in the larger class of the smart materials that can act both as sensors and actuators. Ferro-piezoelectrics are the active elements in an amazingly large number of applications from gas lighters, desk-jet printers and micromanipulators to ultrasound generators in medical applications, fish finders, sonars, movement detectors, parking aids, and many others. More sophisticated applications already in the market include ski dampers or tennis rackets that reorient themselves according to the strike. However, further development of ferroelectric applications is hampered by problems with the behaviour of these materials at the nanoscale, some of them of fundamental origin . In particular, the piezoelectric response scales with thickness and substantial improvement is still needed to obtain large enough electromechanical responses in thin film form. Luckily research in ferroelectric thin films is growing in recent years and has shown that the roles of strain, depolarization fields and domain configurations (regions with polarisation along the different allowed directions) are mutually intertwined in ferroelectric thin films, and dictate the physics and functional properties of devices. We can use this knowledge to our advantage in order to enhance the functional properties of thin films. The strain imposed by the substrate onto which the films are epitaxially grown provides extra degrees of freedom to tune the behaviour of the films. Strain can increase transition temperatures, induce phase changes and modify the symmetry of the films. The symmetry differences usually bring important changes in the functional properties (polarization, dielectric permittivity, piezoelectric response, etc), which are highly anisotropic. In recent years theorists have gained considerable insight into the behaviour of thin films of classical ferroelectric perovskites, such as BaTiO3 or PbTiO3 (with tetragonal and rhombohedral bulk ground states) under biaxial strain (deposited on cubic perovskites substrates)[2,3]. Novel crystallographic phases with low symmetries have been predicted that do not exist in bulk and can give place, due to the presence shear components of the piezoelectric and dielectric tensors that allow rotation of the polarization, to an increase in the materials response to an external electric field . Compressive strain tends to keep the uniaxial symmetry with the polarization perpendicular to the film, while large tensile strain favors the uniaxial polarization lying in-plane. The prime candidates to show those unique low symmetry ferroelectric phases are thin films of tetragonal perovskites under a small tensile strain [1,2]. No experimental work exists on this kind of films due to the lack of suitable substrates. Nonetheless, recently new substrates have become available to tune the strain . 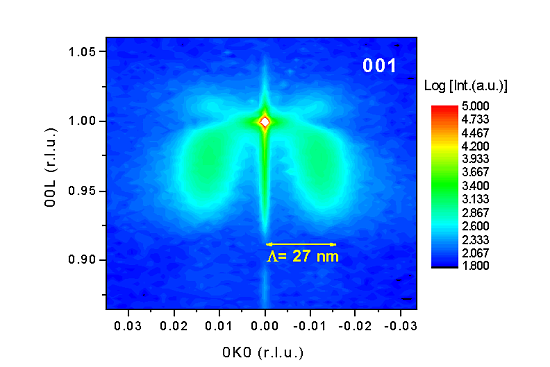 In particular, DyScO3, with a lattice parameters of about 3.94Å provides a slight tensile strain on thin films of PbTiO3 with a 3.90Å in-plane unit cell. Apart from the strain, the electrical boundary conditions are very important in ferroelectric thin films. It is well known that huge depolarizing fields (inversely proportional to the film thickness) appear in polar thin films. Under these fields a homogeneous ferroelectric is not stable and the film tends to break down into domains with polarization pointing ‘up’ and ‘down’ in order to avoid net surface charges (see Fig. 1a). These domain patterns form perfectly periodic polar stripes that can contribute to the x-ray diffraction signal as modulations in the diffuse scattering . Therefore, they provide a new tool to characterize the polar state in very thin, fully strained films. In this collaboration between the Universities of Twente and Groningen and HASYLAB we have grown fully-strained 5nm thin films of PbTiO3 under small tensile strain on DyScO3 substrates, by using RHEED-assisted Pulsed Laser Deposition. With this technique thin films can be built atomic layer-by-atomic-layer allowing a great control at the unit cell level. A mapping of the reciprocal space performed by synchrotron x-ray diffraction at the beamline W1 at HASYLAB on those films has revealed an intensity modulation with in-plane periodicity of about 30nm (70 unit cells), due to polar stripe domains (Figs. 2,3). The reciprocal space points around which the satellites are shown reveal the symmetry of the polarization inside the stripes, while the direction of the modulation tells us about the orientation of the stripes. Our analysis makes full use of the brilliance of synchrotron radiation in order to perform grazing incidence diffraction (GID) measurements (see Fig. 3). This has allowed us to extract all the polar symmetry information contained in the diffuse scattering modulation, which proved to be essential, as the Bragg peaks alone do not show any splitting due to the high coherence between film and substrate. Because the intensity modulations were not only found around Bragg reflections with L ≠ 0 (Fig. 2) but also around those with L= 0 (Fig. 3), our measurements thus show that the stripes carry in-plane as well as out-of-plane components of the polarization  (as shown in Fig. 1b). Thus, it is shown that when PbTiO3 is grown under a small tensile strain (of about 1%) the polarization tilts away from the substrate normal but does not reach a full in-plane configuration. From theoretical and symmetry considerations, in this phase, which lacks a unique symmetry axis, the polarization has a larger freedom to rotate and piezoelectric and dielectric responses could be drastically enhanced. Work is in progress to determine if this is the case.